Sometimes people need a little extra help getting around, but that doesn’t necessarily mean dependence. Many people decide to get a mobility scooter to manage daily tasks, whether in the home or outside. In most cases, mobility scooters act as a great supportive tool for people with disabilities. Unlike wheelchairs, they don’t require much physical effort or anyone to push you, and can be more flexible when it comes to speed. Despite their usefulness, there is no one-size-fits-all. The variety of options available to consumers means you’ll have to think about how you want to use the scooter and your physical needs before investing in what might be an expensive purchase. • Wheels – mobility scooters usually come with 3 or 4 wheels, and sometimes 5 (two extra, tiny wheels in the front for support of the main front wheel). Wheels are usually pneumatic or made of solid rubber. • Tiller – this is the long vertical portion of the scooter where the handlebars and control panel are attached. You can usually adjust the height and angle of the tiller to your comfort. • Controls – most come equipped with a control panel in the center of or on the handlebars. You can use this along with the handle bars to turn, go forward, adjust the speeds, brake, and reverse. • Seat – all mobility scooters come with a seat, which is usually adjustable and can swivel to easily get in and out of the scooter. • Chassis – this fiberglass or metal base is where all the important parts, like the motor and battery, are stored. • Brakes – most scooters engage a parking break automatically when the scooter comes to a stop to prevent movement until the user wants to move forward or back. • Batteries – usually electric, the batteries can be charged on the scooter or by removing them, depending on the model. Unfortunately, it’s hard to find a scooter that works just as well indoors as it does outdoors, so you’ll have to decide where you’ll be using the scooter the most. Obviously, each type of scooter has different benefits and drawbacks. If you need to move quickly and get around in a variety of harsher environments, or move around a hilly area, an outdoor scooter might be the best option. However, if you’ll mostly be using the scooter at home, you don’t need speed, just something that is small and you can steer around the tight spaces in your home. Wherever you plan to use your scooter, it’s important to make sure it fits into the space you’ll be going. If you want a scooter that you can take with you to the grocery store, it has to be able to fit into your car. If you want to use the scooter in your home, it has to fit through all the doorways. In that sense, before you buy a scooter you should gauge its measurements to make sure you’ll actually be able to use it everywhere you want to. Aside from the overall function, you may need to decide whether you need more or less stability. The more wheels you have, the greater stability there is. Some people, especially if you are tall or have a higher weight, find that turning on a 3-wheeler can destabilize the vehicle and cause it to tip over. However, using four wheels means having to compromise on your ability to make tighter turns. In that case, a 5-wheel vehicle might be the solution. Scooters are designed to carry different amounts of weight, but if you have a high BMI, weight might not be the only concern. Comfort is also key, and most traditional scooters aren’t made to fit heavier set people. However, heavy-duty scooters are. They can hold even 500 pounds, and have a larger seat and better support for heavy individuals. The cheapest mobility scooters come in around $700, usually more, and can easily get up to $3,000. Luckily, if you do have a disability Medicare part B should cover up to 80 percent of the costs. Some companies will even help you navigate the system to facilitate this advantage. 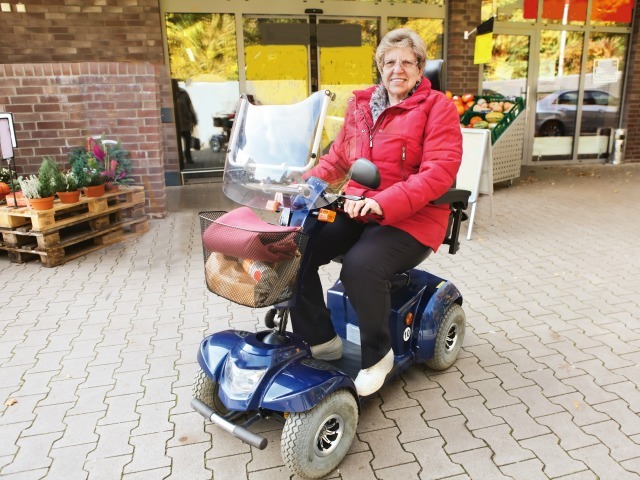 Medicare provides detailed information about the requirements you need to meet to qualify for a mobility scooter. If you do qualify, Medicare will also help you pay for replacement pieces if bought from a contract supplier. Accessories aren’t necessary, but some might be practical. If you are going to go shopping using your scooter, a basket seems like an obvious choice to store groceries, while a cane or crutch holder might extend your mobility so you don’t depend on the scooter completely. Keeping these options in mind, you can better decide which scooter would be best for you. However, even if you think you have a good idea of what you’re looking for, it’s always a good idea to test the scooter first. If you can’t test the scooter, in many cases Medicare allows buyers to rent the equipment for 13 months, which may act as a safeguard.